With warm temperatures and clear skies on the horizon, summer is nearly here. And what better way to take advantage of the weather than camping? This summer, use a camper trailer to enjoy camping with convenience not afforded by a tent while taking a road trip. Whether you’ve just bought a trailer and can’t figure out how to hook it up to your truck, or you are just looking for tips to enhance your experience, let’s cover everything you need to know to have a fantastic summer camping. Before you can enjoy using your camper, you need to get to the campsite. Ensure you have the right vehicle for the job, such as a pickup truck, that can handle hauling a massive trailer. Next, there are two important parts you need: Trailer tires and a tow hitch. 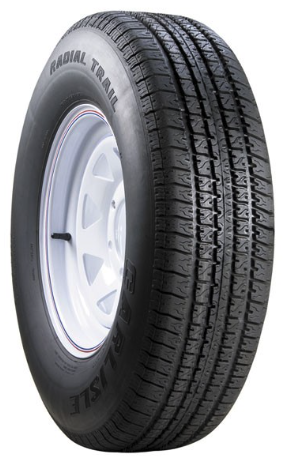 We suggest the Carlisle Radial Trail RH for tires that will get you to your destination faster than other brands if you are on wide open high speed highways. With a higher PSI limit, in turn meaning a top speed of 81 mph instead of 65 mph, you can have more time outdoors. Pro tip: Be sure to check if your vehicle can handle the load. Your truck might need a weight-distribution (W-D) hitch or an anti-sway control device, especially on lighter trucks, if the load is more than 2,000 lbs. Some trucks won’t require the device until 5,000 lbs. Read the owner’s manual for your vehicle, and make sure the maximum tongue weight — how much weight from the trailer is applied as downforce on the back of the tow vehicle — is not more than 15 percent of the trailer’s weight. Anything smaller than a truck or SUV is not likely to be able to handle the load, and will result in disaster. Back to PSI, check your tire pressure before every trip. Weigh your rig, check its height. Know where you will be able to fit, rather than guessing, or you will end up either tearing an overhang off, or without a camper roof. Next, you need to know how to use your tire hitch. How are you going to attach the trailer to the hitch? Will you have another person on a radio helping? A rear-view camera? Find the way that works best for you, and practice before starting out on your trip. This goes for driving, as well — take a test drive, if possible, to get a feel for the trailer. Pro tip: When unhitching the fifth wheel, use a marker to add hash marks to the landing leg, so you know the leg elevation for hitching. From there, use levels to ensure that your trailer is parallel to the ground. Practice this a few times, as well. Once you have picked out a camping spot (You can use campsite finders to help you find a park with campsites), and you have checked that your rig is safely attached, it’s time to hit the road. Remember that towing a heavy trailer behind your vehicle means the rules of the road, acceleration and stopping distance will all drastically change. Take things slow if you need to, enjoying the scenery. Take your time backing up. Remember, make sure you are within weight tolerances, and that your tires are properly inflated. Otherwise, you could suffer a blowout while driving, potentially doing expensive damage to your camper. Trailer tires are different from regular tires; be sure to have spares of both. They will also have different PSI ranges, so be sure to check on the wheel itself for the maximum pressure allowed. This can also affect speed, depending on the weight of the trailer. For example, the Radial RH trailer tires will achieve their top speed of 81 at a lower PSI, though you will need to be cautious of underinflating. Once you arrive, it’s time to set up camp. Come armed with a checklist, to ensure you don’t miss any steps. Check in, and head over to your assigned spot. Before making your hookups, like electrical and water, run the water hose for a few seconds, to clean out any rust. Otherwise, that rust will go into your tank. Pro tip: To make your camping trip even better: buy a splitter with two turn-offs, and a clear sewer water hose adaptor extension. By cleaning out black water (sewer) and then grey water (dish and shower), and then using the splitter to pump water back into the tank, your trailer’s tank will be spotless. Be sure to drain the black water when the tank is about ⅔ full. If you are going to be camping out in the desert or other non-campsite, known as “boondocking,” be sure to have extra water and supplies. Bring more water and food than you will think you need, and conserve — especially if you don’t want to make constant dump trips. It also doesn’t hurt to invest in a good camping carpet. Bigger can be better, as less dirt and debris will enter the cabin. To clean your windows, roof, and front bubble, invest in a zoom ladder. Even if your camper comes with a ladder built onto the chassis, a backup will be useful, and invaluable when waxing the front bubble. Want softer lights while camping, but don’t want a fire to start inside your trailer? Invest in some LED candles. They run off batteries and do not produce a flame, and are less harsh than the interior lighting of the camper. Finally, make a second checklist for when it’s time to leave. Is everything stowed away securely? The water tank flushed? A step-by-step checklist will help organized all the important aspects for cleaning up and leaving the campsite in the same or better condition than when you arrived, and will ensure a safe return trip. Now go have fun camping!